Studio Glowacka is working with Eleanor Rennie Architects on a temporary display and table system for a new co-working space in Peckham Rye. 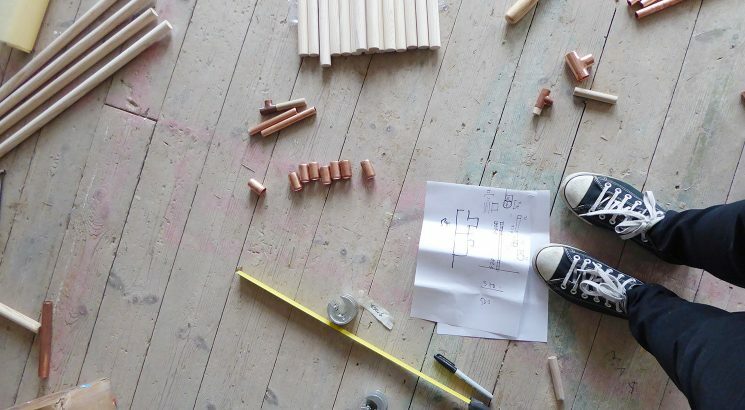 Copper tubes, birch ply and ‘pop’ orange come together against a backdrop of raw building shell – watch this space! 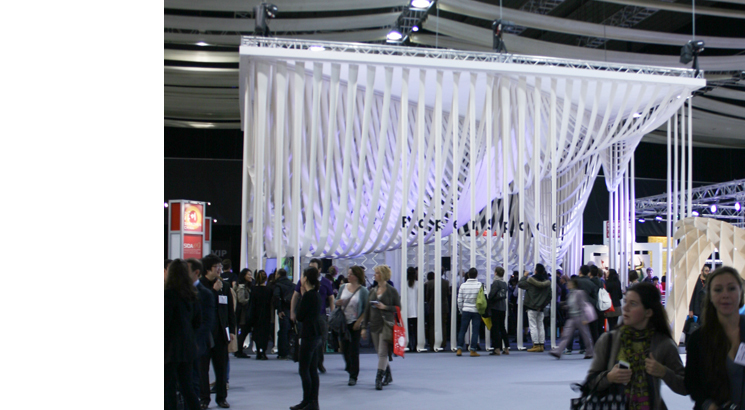 ‘Materials Cloud’ Bar at 100% Design is now open until Saturday 24th September. Come and see it during London Design Festival. 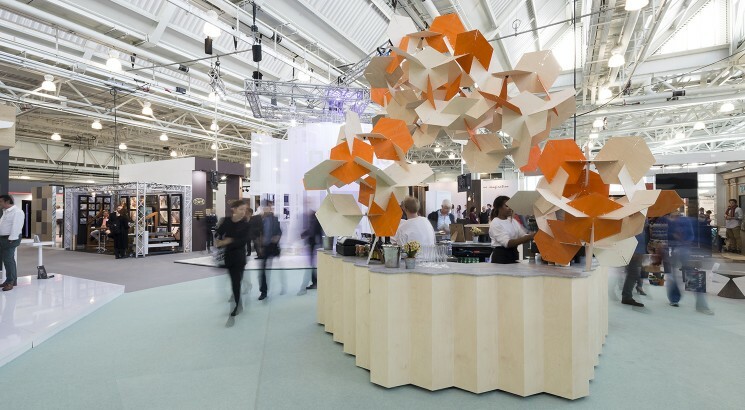 Studio Glowacka have been commissioned to design a feature bar ‘Materials Cloud’ for 100% Design. The Materials Cloud bar will be the central focus for the new Design and Build section of the show. The show is open 21st – 24th September. Studio Glowacka is working on a concept for a new-build holiday home for an artist in Devon. Studio Glowacka and Paper Space featured in AIT magazine. Happy New Year of the Wooden Horse! 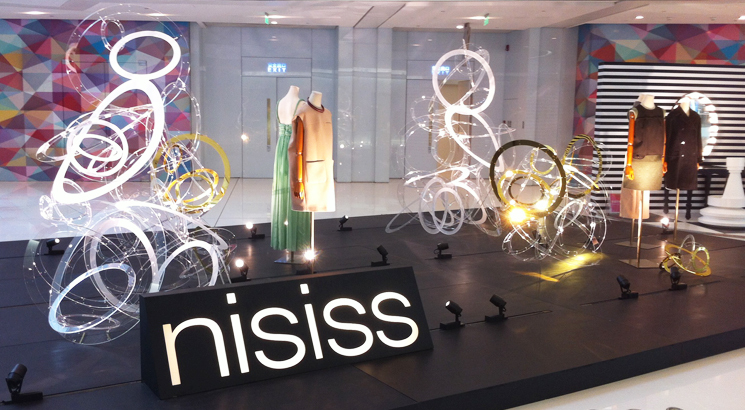 Studio Glowacka’s artistic installation for the launch of the new Nisiss store in Chengdu, China has been installed. Studio Glowacka have been shortlisted for the British Council and the British Fashion Council International Fashion Showcase exhibition and event which will take place during AW14 London Fashion Week in February. Studio Glowacka have been commissioned to create an artistic installation to display clothing from the Nisiss collection for the launch of the new Nisiss store in Chengdu, China. 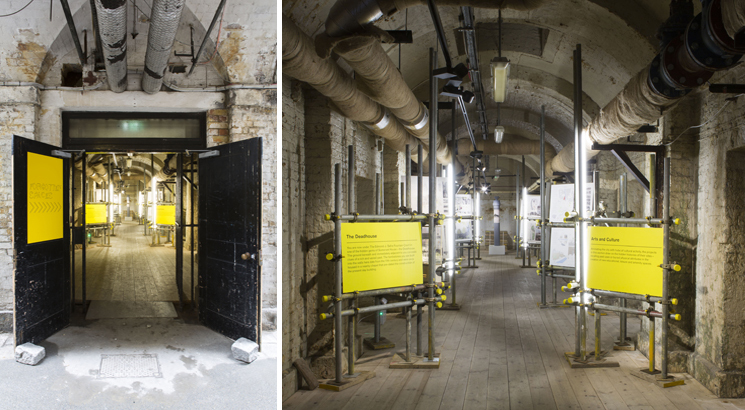 The RIBA Forgotten Spaces Exhibition is featured on AJ’s News Page. RIBA Forgotten Spaces Exhibition designed by Studio Glowacka, with graphics by Thomas Matthews, opens at Somerset House tomorrow. 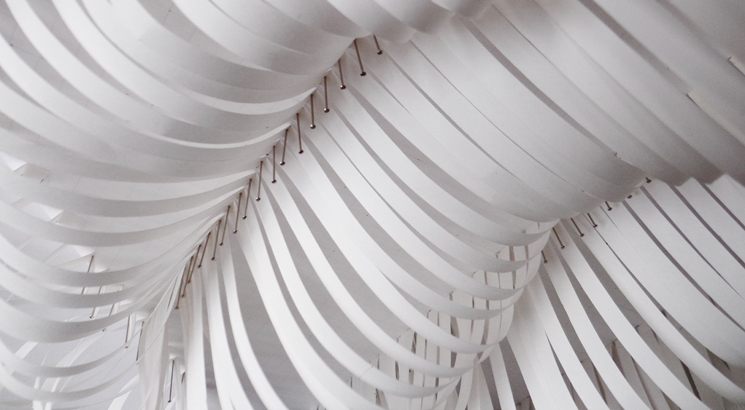 Studio Glowacka, in collaboration with Maria Fulford Architects, have completed the installation of Paper Space – the International Hub for this year’s 100% Design Show. Paper Space has been featured on Dezeen. Studio Glowacka, in collaboration with Maria Fulford Architects, have been commissioned by Media 10 Ltd to design the International Hub for this year’s 100% Design Show. 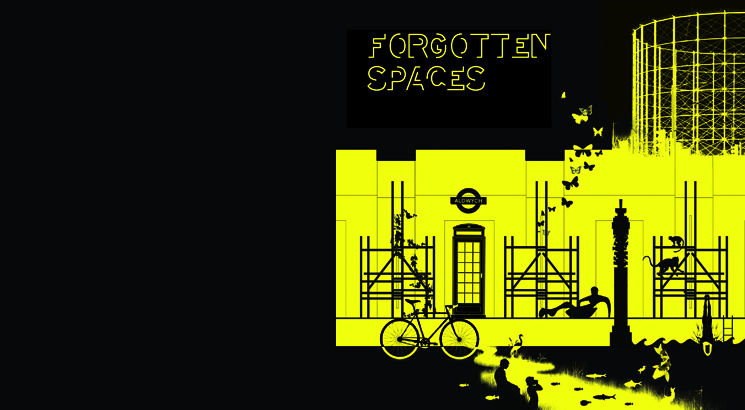 Studio Glowacka have been commissioned by the RIBA to design the Forgotten Spaces exhibition, which will be held at Somerset House in October. Our installation project for Nisiss, which was part of the RIBA Xintiandi Windows festival, has been included in the RIBA London Portfolio showcase. Studio Glowacka have been asked by Shui On Land to produce a concept design for an art installation which will hang in the main entrance atrium at Xintiandi shopping centre in Shanghai. Studio Glowacka were invited to take part in a one day workshop to explore the potential future uses for the listed Lambeth Town Hall building. The workshop brought together local Council representatives, architects, designers, artists and local business leaders to brainstorm ideas which were presented to a wider local audience the following day. The Lambeth Town Hall will be retained and refurbished as a focal point for a wider initiative to re-develop a key plot of land in central Brixton. Studio Glowacka’s concept models of the RIBA Xintiandi Windows project, which were exhibited at the 2012 RIBA Architecture Open exhibition, are now displayed at the RIBA as part of the general wall exhibits till January 2013. Studio Glowacka will be exhibiting concept models of the RIBA Xintiandi Windows project at the 2012 RIBA Architecture Open exhibition in Gallery 1 at the RIBA, Portland Place. The exhibition runs from 2nd October to 3rd November. Studio Glowacka returned to Shanghai to oversee the installation of our project for RIBA Xintiandi Windows event. Studio Glowacka have been asked to produce designs for 8 additional niche windows in the entrance space of Xintiandi Style, Shanghai. Different colours of transparent tubes and tube configurations will be used in each window and each niche window will be used by a different retailer to display their products. We have just sent a 1:1 sample of the elements which will make up the installation for Nisiss in Shanghai. 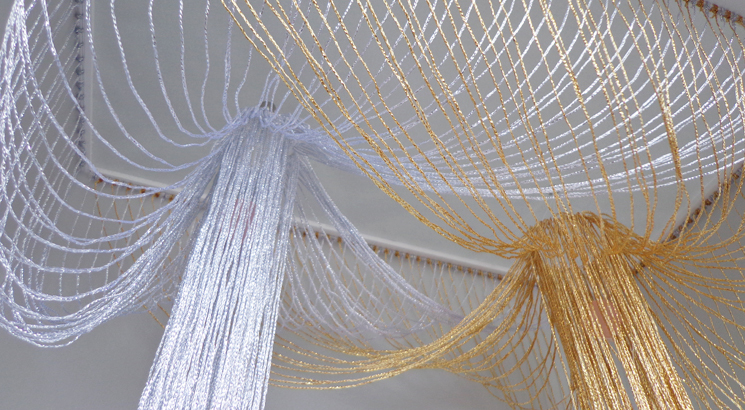 The installation is proposed to be made using clear acrylic tubes, hemp rope, plywood and clear cable ties. Studio Glowacka are collaborating with Zoe Defert Architects on the design of a playhouse in Richmond, London. We have been making concept models to explore initial ideas based around a drawing of the ideal playhouse made by our 9 year old ‘expert’. Studio Glowacka founder Agnieszka Glowacka attended the launch of the book “New Arcadians: Emerging UK Architects”, which features the work of Glowacka Rennie. 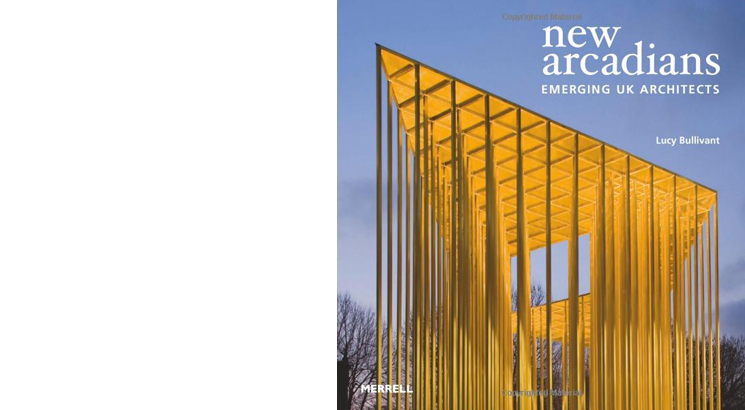 In “New Arcadians: Emerging UK Architects” the author Lucy Bullivant profiles 15+ cutting-edge UK-based practices, presenting recent key projects as well as interviews with the architects. Studio Glowacka have visited Shanghai to meet the Client team, discuss our concept ideas and choose a preferred concept to develop over the coming months. We visited our shop and explored the context of the site. Studio Glowacka have been selected as one of nine young British practices from 80 applicants to take part in the first Shanghai Shop Windows project. We have been paired up with Nisiss – an exclusive Chinese women’s clothing brand to create an architectural window installation in their shop in the Xintiandi shopping centre in Shanghai. We will be flying out to Shanghai at the end of this month to meet with our Client and see the site. 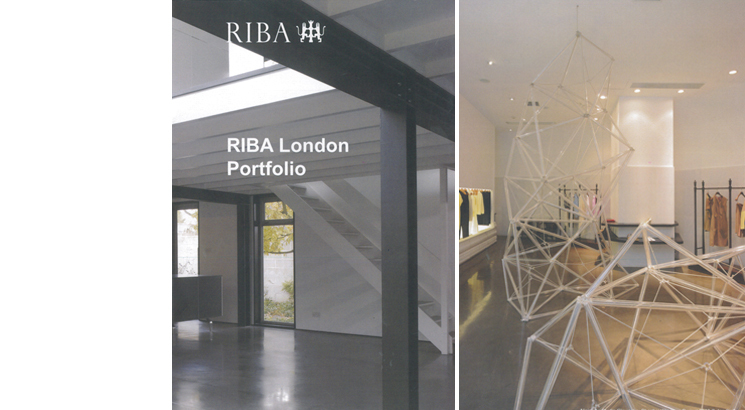 Studio Glowacka have been shortlisted for the RIBA Shanghai Shop Windows project. Studio Glowacka gives talk on V&A Ladies Amenities Project to 3rd year students at Bartlett, UCL as part of the “Making Buildings” lecture series. Studio Glowacka set up by Agnieszka Glowacka.